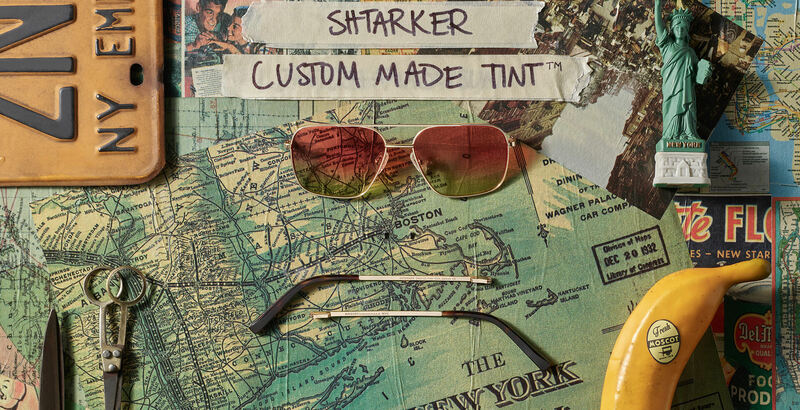 Shop the new custom tinted SHTARKER with Gold frames and Aqua Sunrise Tint from MOSCOT. Our iconic frames, now available in fashion-forward tints. Model is wearing The SHTARKER in Gold with Mellow Yellow Tint in size 54. Model is wearing The SHTARKER in Gold with Cabernet Tint in size 54. Model is wearing The SHTARKER in Gold with Woodstock Orange Tint in size 54.